In many cases, young people are the main change agents in their communities. Therefore in many project interventions, BNMT Nepal works with and through local youth groups in getting messages related to health across to the community. This particular case study is about providing life skills orientation to a local youth group in Ilam district in Eastern Nepal. When BNMT first started working in the district, young people were not able to express their issues mostly because of the lack in confidence and public speaking skills. Most were school dropouts and were not aware of their health related rights. After conducting a situation analysis, BNMT Nepal staff members invited local youth to participate in a tailor-made training that included information on HIV/AIDS and Sexually Transmitted Diseases. The unique aspect of this training was that besides knowledge on health rights and diseases, training on life skills including presentation skills was also imparted. Just the three-day orientation made a difference in the lives of the young people who attended the training. 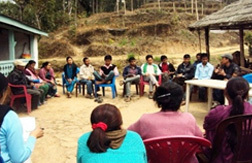 At the end of the training, participants got together and formed a local club “Pokhari Youth Club” in 2011. Since then, the club has been active in the community raising issues amongst migrant communities on HIV/AIDS and STIs. They have also conducted awareness campaigns like Door to Door visits, Street Dramas, Health Camps and School Health Programmes. One of the most notable actions of the Pokhari Yuwa Club was their campaign on raising awareness amongst migrant workers and their families. The campaign was recognised by local government and health authorities as well.